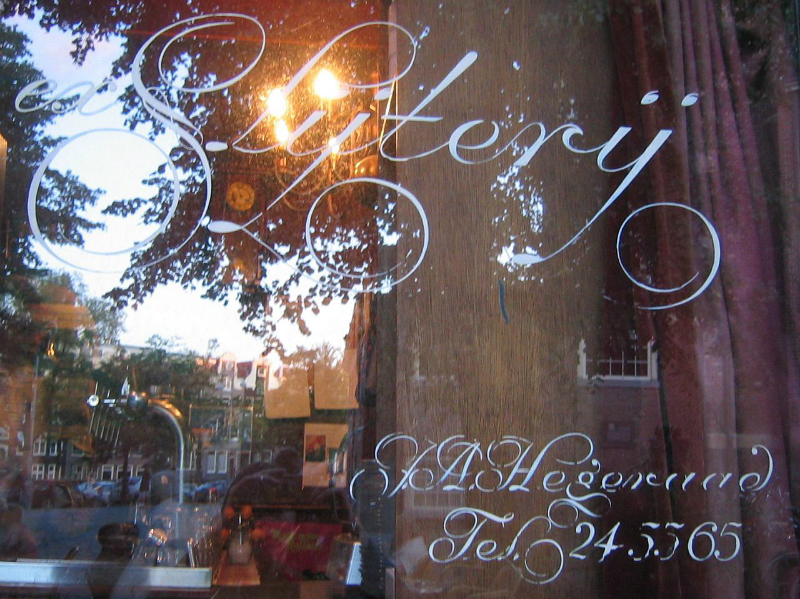 A historical perspective of the Amsterdam Krulletter (curly script), its origin, development and continuation with Dutch brush writers and painters. Erik Winkler reveals the true and complete story. 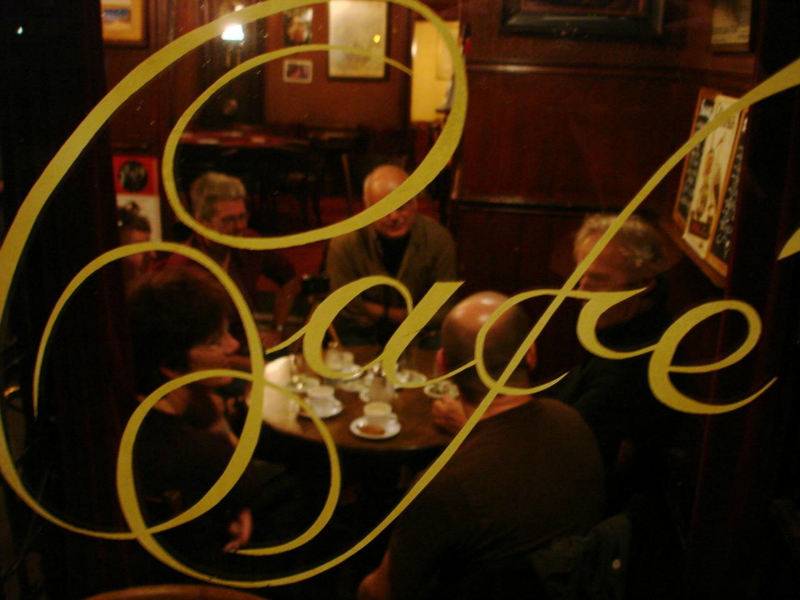 Amsterdam swashes find their origins with so-called ‘pen writers and calligraphers’ in the 16th and 17th centuries. 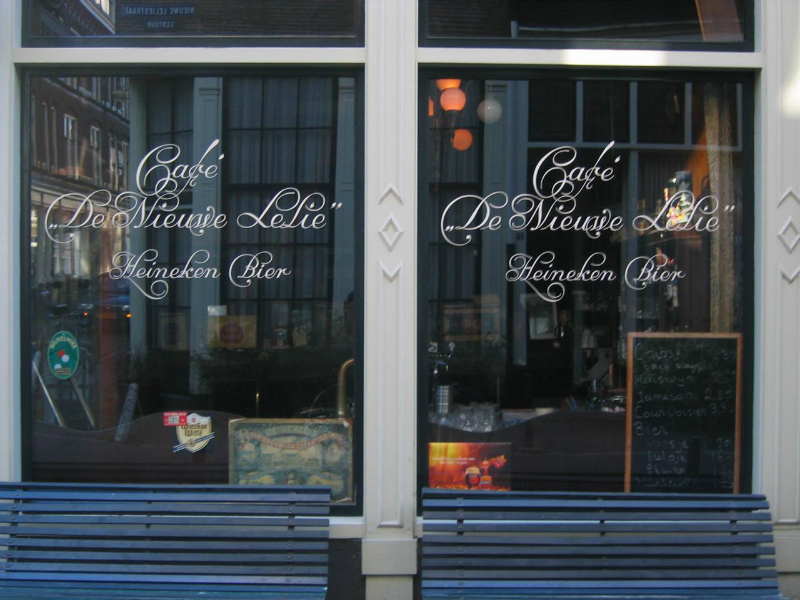 The Amsterdam brush writer Evert Douwes (deceased in 1896) used, as the first documented sign painter, the calligraphy of former Dutch writers as the basis for the Amsterdam Script. J.W. Beekmann (1866 - 1918) was as of 1881 Evert Douwes’ student. 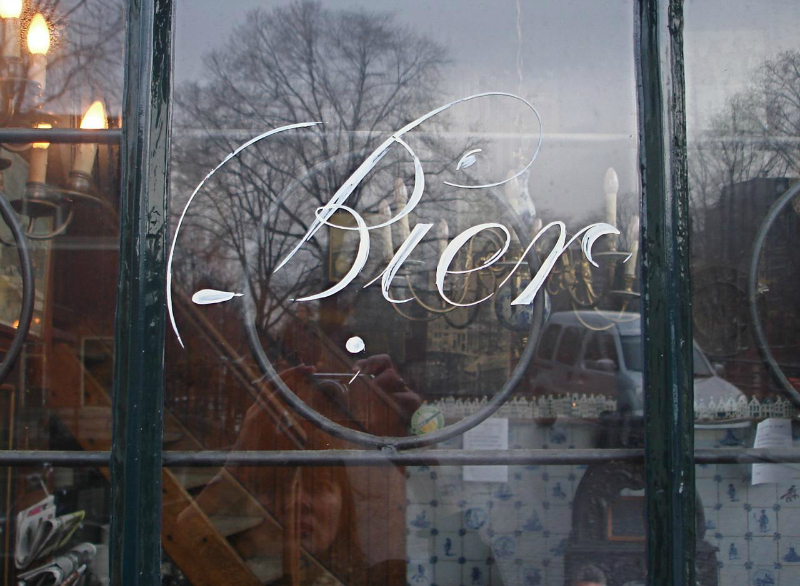 He learned how to paint and script paint the Amsterdam Script. 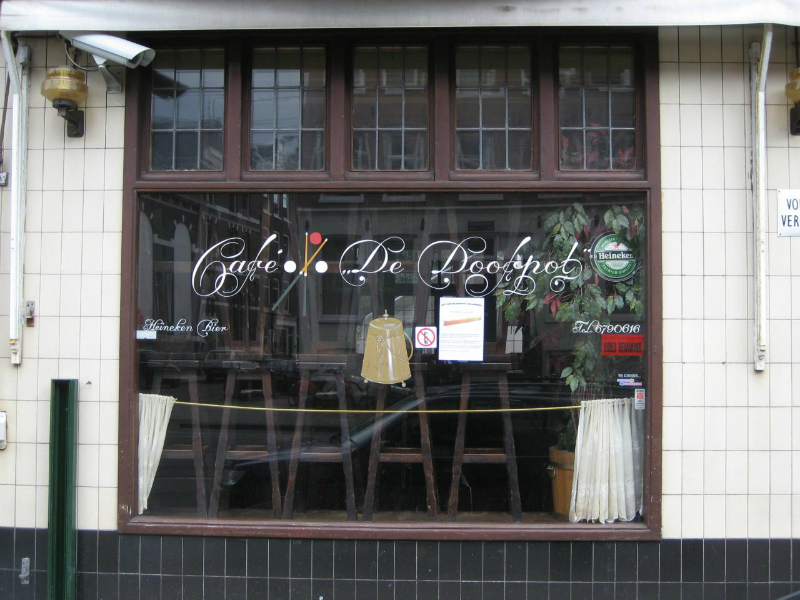 In 1896 he was the successor of 'Douwes & Co.' and in 1906, until his death in 1918, he started his own business under his own name. J. S. Beekmann (born in 1895) was from 1908 onwards apprentice at his father’s business. In 1918 he took over the business of his deceased father and perfects 'The Amsterdam Script' untill 1966. Over the years the script got slightly simpler, but its original character remains. 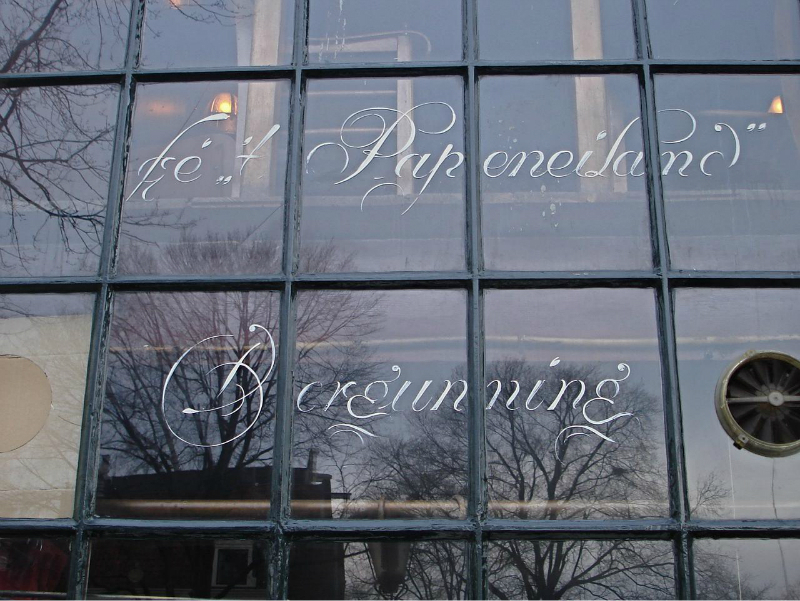 J. S. Beekmann was besides entrepreneur also teacher at the National School of Painters in Utrecht and over there he taught students the character and the painting of his 'Amsterdam Script'. 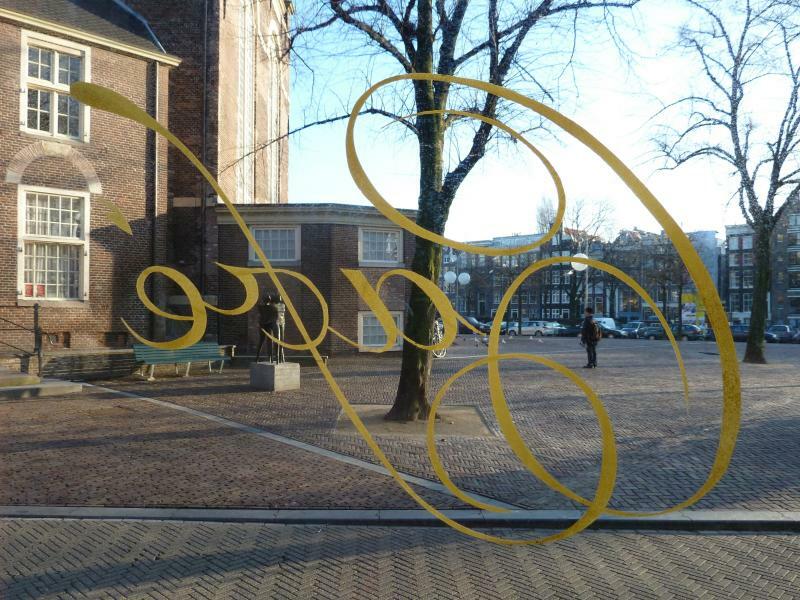 During this period he got to know colleague and fellow entrepreneur Jan Willem Joseph Visser (1911 – 1987) and they shared the love for script painting in a graceful, curly style. J.W.J. Visser is the inventor of the ‘Amsterdam Krulletter’. 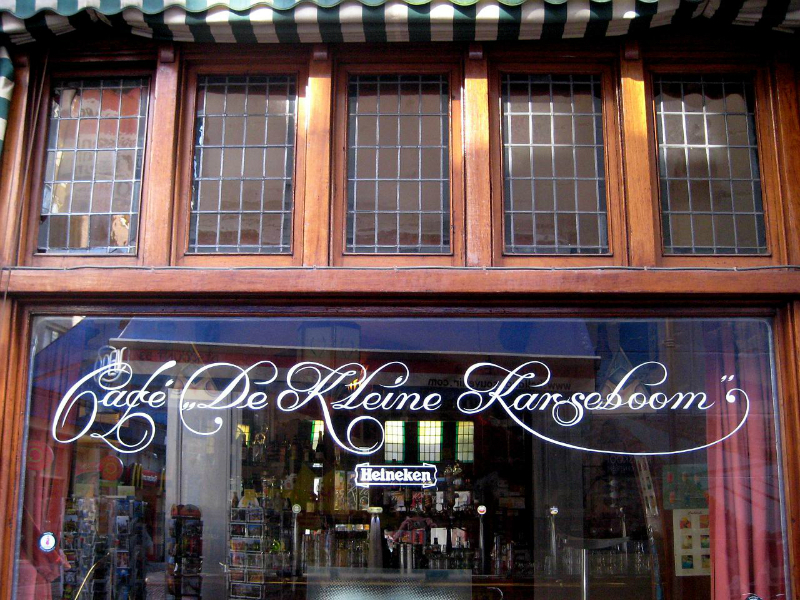 His inspiration for this script he finds in the calligraphy of 'pen writer' Jan van der Velde (1568-1623). 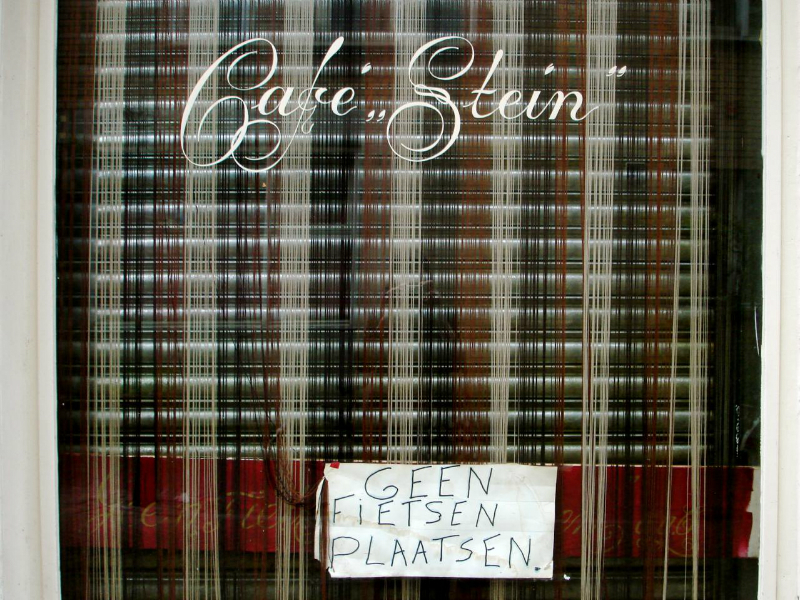 He is the one that painted the ‘Amsterdam Krulletter' from the late 40s till the 60s of the 20th century on many Amsterdam café windows. 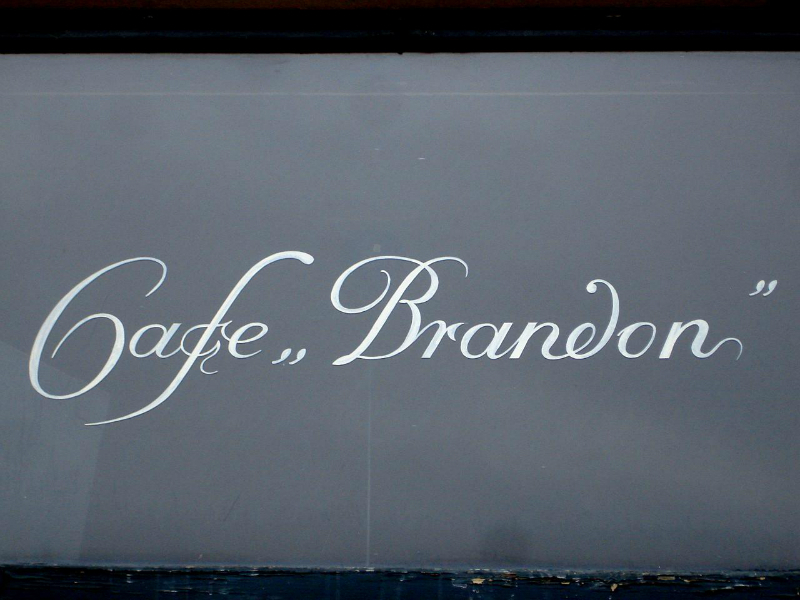 Besides windows he also painted this script on wooden beams and liqueur and gin barrels. 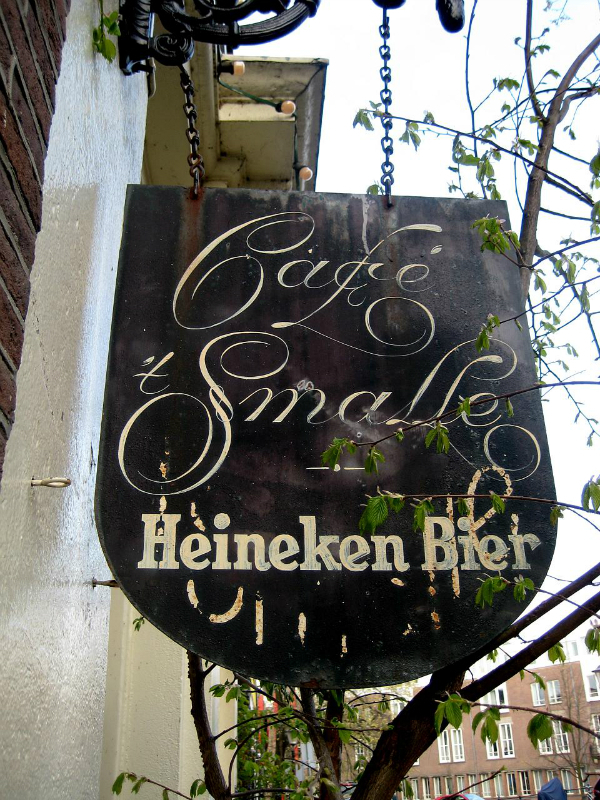 He was the regular script painter of the Amstel Brewery until his retirement in 1968. 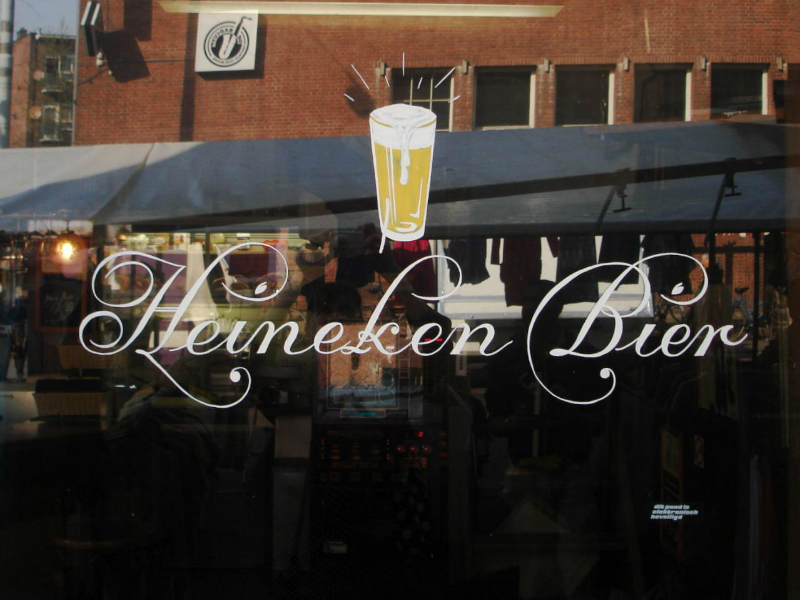 In 1968 the Amstel Brewery merged with the Heineken Brewery and L. Beukeboom became the regular script painter for the Heineken Brewery. Because so little is written about J.W.J. Visser’s work, his name remained relatively unknown. I have great appreciation for the work of J.W.J. Visser. I am happy to see that there is a growing international attention for his characteristic 'Amsterdam Krulletter'. Attempts have been made to digitize his script as a computer-usable font. However, these efforts are not successful, because the connections, transitions from thick to thin, writing direction, spacing and the up and down stroke of the brush, are lost since it lacks the sense of a smooth gradience of the script. As Mr. Beekmann in 1966 said: "Each loop, each eye in the writing direction, each deviation, is disturbing."